Ansonia Clock Co. mantle clock, "Cabinet F", ca 1894. 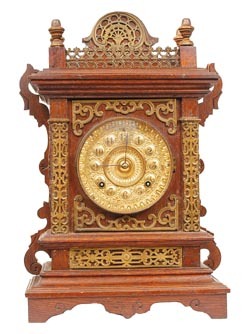 They made 6different case styles of this series of cabinet clocks, all heavily decoratedwith brass trimmings on the Antique Oak case. This model is 19 inches high, with a good dark oak finish and has retained all the brass trim except forthe small one inch pieces on the 4 corners. The four top finials are oldreplacements. There is a wood split on a side piece that will glue togethereasily. Movement is 8 day, running good, striking half hours on a standinggong. The brass dial has raised numerals, correct hands. The original pendulumhas been replaced. A little cleaning and it will be real nice. Ly-Ansonia No. 851.